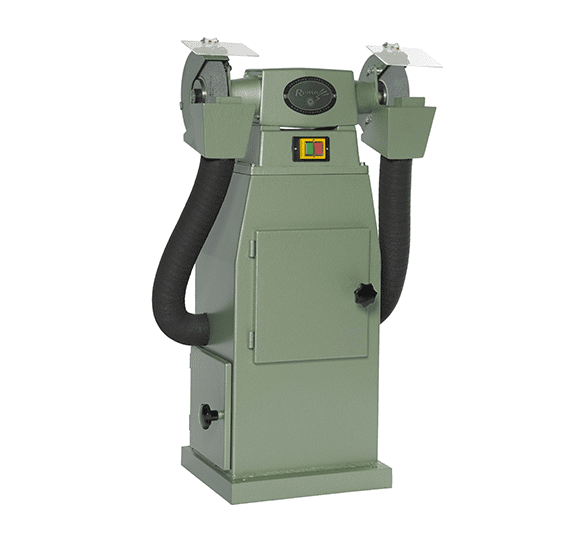 With the workshop grinding machines with built-in extraction, the working dust is effectively extracted using a protected process. The extraction unit is installed in the stand of the machine. A water filter and a plastic upstream and downstream filter (also built into the stand) filter the dust. The exceptionally stable machine design ensures vibration-free operation even at maximum performance and thus a long service life. The dust which is often generated during grinding and which is hazardous to health is extracted directly at the point of origin by the extraction system and thus contributes to healthy working conditions at the workplace. All workshop grinding machines with suction are equipped with overcurrent and overvoltage protection. In addition, a triple lockable padlock is fitted as standard. A wide range of accessories can be supplied as an option for the respective application. The safety of the grinding machine is important to us and is constantly monitored. This is also reflected in the CE marking of every grinding machine.